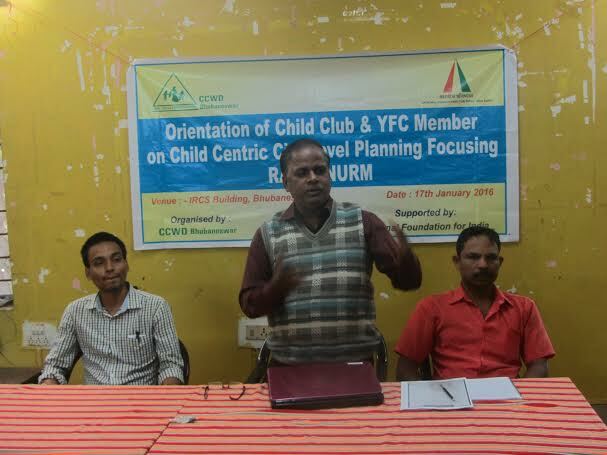 City based voluntary organization named center for child and women development with the support of National foundation for India organized an orientation programme focusing to Ray/ JNNURM here at Red Cross Bhawan here on Sunday. As many as 35 members from child club and Youth facilitation center from science park, Niladri vihar & Tuighoot participated in this child centric city level planning programme. The objective the orientation was that the children and youth find better opportunity to enjoy their rights and entitlements Said secretary of center for child and women development sadasiv swain. During this orientation programme the child club & child media club along with Youth facilitation prepared a model demo on child centric plan for better advocacy with urban local bodies (ULBs). On this occasion the child club members from science park shared the need of better management of traffic during school times and others members from Tuighoot and Niladri Vihar addressed the problems like- safe drinking water, drainage system& toilet etc. Lastly Bhaskar Chandra Pradhan proposed a warm vote of thanks to all. The programme coordinated by Debabrat Mahunta, Biswa Ranjan Mishra, Soumya Ranjan Mallick and Damayanti Sahu.